Yesterday I took yet another 17+ hour U-turn...the point was to attempt to finish three US routes nationally: US 19E, US 19W, and US 221. I took my usual route to/from Southwestern VA: VA 3, VA 20, US 15, VA 231, VA 22, SR 616, I-64, I-81. Not too much to report...the Gordonsville cutouts remain. It is nice to have 3 travel lanes on I-81 SB all the way from Exit 128 to Exit 118. I took I-77 south to US 58-221. I-77 could use some climbing lanes. Trucks were doing lots of rolling roadblocks as they attempted the slowest passes in the history of transportation. VA 392's facility at Hillsville (Southwestern Training Facility) is scheduled to close but looked open from the entrance. VA 392 is still posted. Two of the three VA 89 cutouts along WB US 58-221 have been replaced. One is now an error US 89 shield. The one remaining cutout is the one half-way covered by other signs. The VA 89-97 cutout assembly remains in place as does the one VA 89 south cutout near the school. I always forget how painfully slow driving through Galax is. I took US 58-221 to Independence to follow US 221 to Jefferson, NC. The circle 274 shields are still present at VA 274. I followed NC 88 to Tennessee - little elevation change but pretty twisty. I then used Old US 421 to get to Sugar Grove. The white Amantha double-sided signpost is still present. At Boone I followed NC 105 to Linville, discovering a NC 194 Truck at Grandfather Mtn. NC 105 is really nice and have no idea why US 221 hasn't been moved to it. I used NC 181 to NC 183 back to US 221 down to Marion. 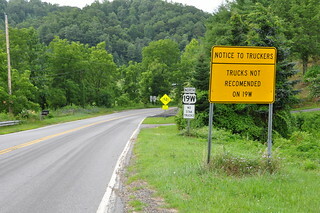 For some reason, NC 226A gets plenty of signage at the US 221-NC 226 split. I know it's nearby but it is a road around nowhere. The US 221 Marion bypass is receiving a jersey wall to separate the lanes - had just been a slightly raised concrete median. I drove NC 80 over the mountain to US 19E. I drove NC 80 from the BRP to US 70 20-something years ago and completely forgot just how bad this road is...may be the hardest paved road in NC to drive. I used US 19E to US 19W north to I-26. US 19E is being widended from Micahville west to its current lane drop west of Burnsville. US 19W was an extremely quiet road. Almost no traffic except a flat bed semi heading southbound near the state line. No idea how that truck can make those curves. US 19W should be dropped as a US route. Not quite as bad as NC 80 but it does have some challenges in the state line area. Finding that getting to Erwin, TN took forever, I had to abandon the rest of the attempted agenda (US 321 back to NC then NC 194 to US 19E north back to Bristol). Instead I followed I-26 to I-81. I did take a brief detour to drive old VA 80 from US 11 to VA 91...full of 25 mph curves. The patched VA 91 cutout at the east end of SR 803 (old VA 80) is gone. I used SR 762 (old VA 79) to go back to I-81. Two of the three VA 89 cutouts along WB US 58-221 have been replaced. One is now an error US 89 shield. The one remaining cutout is the one half-way covered by other signs. Forgot to mention this from my trip out to Nashville/Lebanon. Also missed the 274 circle shields in part because I was on 274 (having taken a 94/274 routing along the north side of the New River). Also, since you weren't east of Hillsville, thought I'd mention that 4-laning of US 58 is well-underway from Meadows of Dan to just east of Big Reed Island Creek, including a northern bypass of SR 638/Laurel Fork. Forgot to mention that the speed limit on I-64 from Exit 107 Yancey Mills to Exit 118 Charlottesville was raised to 70 mph. Yep, I got a few photos when I was driving eastbound. NC 88 becomes SR-67 in Tennessee, and you also went to the oldest community in the state: Trade, TN. 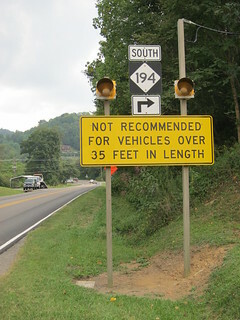 Yes, NC 194 Truck connects between Banner Elk and Valle Crusis, using NC 184 and NC 105... it's been around since the late '90s. Also US 221 Truck overlaps nearly all of NC 105; my guess why they never moved it is because it links Grandfather Mountain and Blowing Rock. What... it goes to Little Switzerland. NC 226A is little over a mile from the US 221/NC 226 split, in Woodlawn. There is also a second NC 226A that bypasses Bakersville. Interesting that they are adding walls now on the Marion Bypass. Haha, you drove NC 80, sucka!!! Should have took the chance to go over to Mount Mitchell State Park and drive the loneliest state highway in North Carolina, NC 128, which connects the BRP to the summit of Mount Mitchell... it is also the highest elevated highway east of the Mississippi River. I agree US 19W should be dropped, but I feel Tennessee clings onto it more than North Carolina does. Yes, trucks should drive along I-26 instead. You didn't drive all of US 221 if you stopped in Marion, it continues south to Chesnee, SC. Did you drive to Damascus, Virginia? The roads to there is tough from any direction. Glad you had fun in the North Carolina High Country. I drove to the places you mentioned (NC 128, US 221 south to Chesnee and beyond) in the late 1980s. Also been to Damascus, VA along both US 58 and VA 91. In fact I had driven the entire Virginia primary system in place as of 2010. I drove NC 80 only because I hadn't driven it between BRP and US 19E. NC 226-A in Little Switzerland still had a cutout leaving NC 226 when I drove it in 1987. You're knowledge is without question since I use that to help me write some of the articles on Wikipedia and link back to your pages. Just thought I comment because I lived in that area you drove around is all. If I was to build a map, it wouldn't show as many roads as yours... how did you make that map anyway? If I am going to Boone, NC, my preferred route is to take US 58 from Abingdon to Damascus, then VA/TN 91 to Mountain City, then US 421 on to Boone. It's a much better route than either US 421 from Bristol or US 321 from Elizabethton.